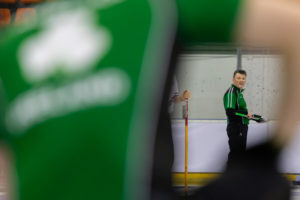 Ireland’s women had a forgettable experience on the ice today and will regroup and come out stronger for the second game against Slovakia later on. 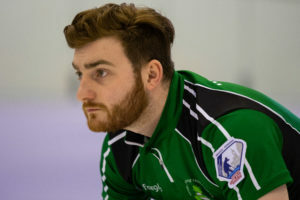 Ireland’s men slipped back down the ladder to fifth place after losing to Bulgaria in the C Division championships in Romania. 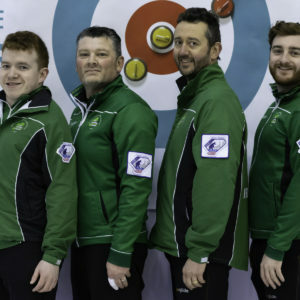 Ireland’s men – Eoin, Steve, Arran and James. Photo credit WCF. 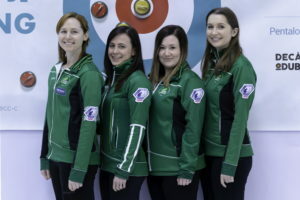 The teams were evenly matched in the first few ends but Bulgaria stayed strong at the business end with steals in the eighth and ninth ends. Ireland skip James Russell. Photo credit WCF. Two games are left, against Liechtenstein and France, to get back up to the top four places to guarantee a place in the medal rounds. Ireland’s men got back to winning ways in some style this morning with a thumping victory over Croatia. 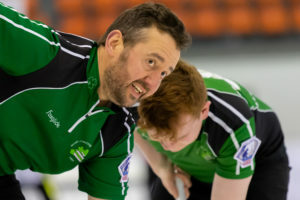 A shock loss of four in the first end, against the head, galvanised James, Arran, Steve and Eoin, and they hit back with a three in the second. They then scored in every end, except losing a one in the sixth. After a steal of three in the eighth, the Croatians offered handshakes. Well done Ireland! Steve surveys the scene at the Euro C. Photo credit WCF. The men are back up to third equal in the table now, level with Belgium and Romania, but behind undefeated leaders France and second placed Slovenia. They face Bulgaria tonight. A forgettable game this evening against Slovenia, losing end after end despite having last stone. Slovenia now leapfrog Ireland in the table, going into second place, pushing the Irish down to fourth. The team will regroup and come out strong tomorrow morning when Ireland face Croatia. A steal of three in an extra end saw the Irish women’s team complete a stunning comeback against Romania. Four down going into the last end they got a four and held their nerve in the extra to seal the victory and record their third win. The team top the table on three wins and one loos the same as Belarus and Slovenia. Well done to all four players and the coach of course! The women face Austria tomorrow afternoon.